Adding to the multitude of new features recently announced on Winston's new website, the Winston Rod Company today released the first installment of its new 10-episode online HD flycasting instructional video series, One on One with Joan Wulff. The first collection of six HD instructional videos are available for viewing immediately: Introduction with Joan Wulff, Creating the Loop, The Basic Cast, The Casting Stroke, False Casting, and Drift. The second installment with the five remaining more advanced HD instructional movies will be announced shortly. 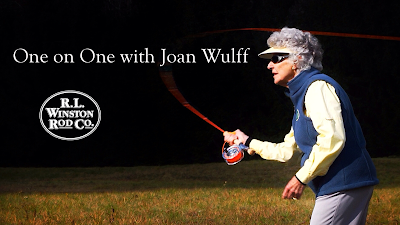 Joan Wulff, a member of Winston's Pro Staff Advisory Team, is one of the greatest flycasters of all time. She has won several flycasting competitions against both men and women, was a National Casting Champion spanning more than two decades and is one of the world's most accomplished flycasting instructors. Joan is a celebrated author, columnist and founder of the Wulff School of Fly Fishing on the Beaverkill River in New York State. She has fished extensively all over the world in saltwater and in freshwater with Winston rods, including the popular Joan Wulff Favorites. "With this new 10-part online instruction series from Winston, I am excited that our expanding technological world will allow anglers, of all skill levels, to access instructional help from wherever they may be." Winstonrods.com allows access to all these new instructional flycasting and other movies in HD anywhere, anytime from your computer, iPhone, iPad or other mobile device.